US Flag Special Shape Hot Air Balloon presents the United States Flag and how it has changed through 225 years. Welcome to the U.S. Flag Special Shape Hot Air Balloon site. Check this out. Click on the year links and it will take you to a picture of what the US flag used to look like. I was amazed at how much it has changed in 225 years. Definitely cool. 1776: January 1 - The Grand Union flag is displayed on Prospect Hill. It has 13 alternate red and white stripes and the British Union Jack in the upper left-hand corner (the canton). 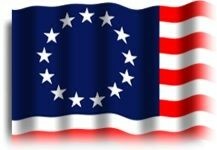 1776: May - Betsy Ross reports that she has sewn the first American flag. 1787: Captain Robert Gray carries the flag around the world on his sailing vessel (around the tip of South America, to China, and beyond). He discovered the Columbia river and named it after his boat The Columbia. His discovery was the basis of America's claim to the Oregon Territory. 1795: Flag with 15 stars and 15 stripes with the additional states of Vermont & Kentucky. 1814: September 14 -- Francis Scott Key writes "The Star-Spangled Banner." It officially becomes the national anthem in 1931. 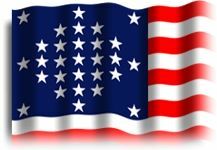 1818: Flag with 20 stars and 13 stripes with the additional states of Tennessee, Ohio, Louisiana, Indiana & Mississippi. The 13 stripes will now be permanent. 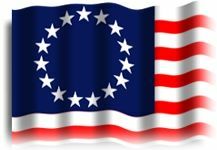 The Act of April 4, 1818 - provided for 13 stripes and one star for each state, to be added to the flag on the 4th of July following the admission of each new state. 1819: Flag with 21 stars with the additional state of Illinois. 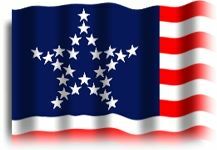 1820: Flag with 23 stars with the additional states of Alabama & Maine. 1822: Flag with 24 stars with the additional state of Missouri. 1836: Flag with 25 stars with the additional state of Arkansas. 1837: Flag with 26 stars with the additional state of Michigan. 1845: Flag with 27 stars with the additional state of Florida. 1846: Flag with 28 stars with the additional state of Texas. 1847: Flag with 29 stars with the additional state of Iowa. 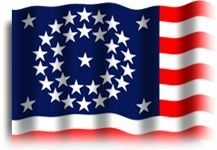 1848: Flag with 30 stars with the additional state of Wisconsin. 1851: Flag with 31 stars with the additional state of California. 1858: Flag with 32 stars with the additional state of Minnesota. 1859: Flag with 33 stars with the additional state of Oregon. 1863: Flag with 35 stars with the additional state of West Virginia. 1865: Flag with 36 stars with the additional state of Nevada. 1867: Flag with 37 stars with the additional state of Nebraska. 1877: Flag with 38 stars with the additional state of Colorado. 1890: Flag with 43 stars with the additional states of North Dakota, South Dakota, Montana, Washington & Idaho. 1891: Flag with 44 stars with the additional state of Wyoming. 1892: "Pledge of Allegiance" first published in a magazine called "The Youth's Companion." Authorship was claimed for James B. Upham and Francis Bellamy. 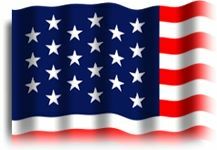 In 1939 the United States Flag Association ruled that Bellamy was the author of the original pledge. The words, "under God" were added on June 14, 1954. In pledging allegiance to the flag, stand with the right hand over the heart or at attention. Men remove their headdress. Persons in uniform give the military salute. All pledge together: I pledge allegiance to the flag of the United States of America and to the Republic for which it stands, one Nation under God, indivisible, with liberty and justice for all. 1896: Flag with 45 stars with the additional state of Utah. 1912: Flag with 48 stars with the additional states of New Mexico & Arizona. Executive Order of President Taft dated June 24, 1912 - established proportions of the flag and provided for arrangement of the stars in six horizontal rows of eight each, a single point of each star to be upward. 1931: Congress officially recognizes `The Star-Spangled Banner' as the national anthem of the United States . Its stirring words were written by Francis Scott Key. 1949: August 3 -- Truman signs bill requesting the President call for Flag Day (June 14) observance each year by proclamation. 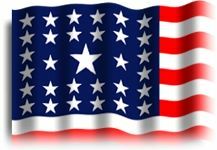 1959: Flag with 49 stars with the additional state of Alaska. Executive Order of President Eisenhower dated January 3, 1959 - provided for the arrangement of the stars in seven rows of seven stars each, staggered horizontally and vertically. Executive Order of President Eisenhower dated August 21, 1959 - provided for the arrangement of the stars in nine rows of stars staggered horizon tally and eleven rows of stars staggered vertically. 1960: Flag with 50 stars with the additional state of Hawaii. 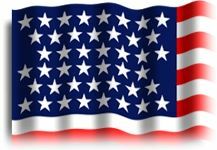 1969: July 20 -- The American flag is placed on the moon by Neil Armstrong. 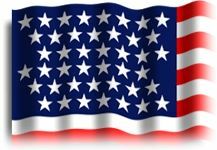 1995: December 12 -- The Flag Desecration Constitutional Amendment is narrowly defeated in the Senate. The Amendment to the Constitution would make burning the flag a punishable crime. United States flag law does not specify the proportions of the flag. The proportions of 10:19, so often quoted, are the product of an executive order of the president, and are actually binding only in certain military uses. 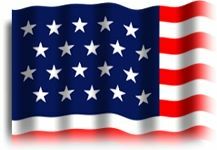 The United States government buys and uses flags in several other proportions (2:3, 3:5, 5:8) for numerous civilian and military applications. Private citizens are free to use their own judgment. The proportions of the U.S. flag are almost the same as those of British naval ensigns in the 1770's. They attained this rather strange proportion because the table of sizes, issued by Samuel Pepys, Secretary of the Admiralty in 1687, laid down that flags should be made a yard long for every breadth of bewper (bunting) used in their construction. At the time bewper was 22 inches wide, so 22 x 36 gave the excellent proportions of 11:18, which are the whole numbers, nearest to the "Golden Ratio" of 1 : 1.618. Later, bewper was woven in successively smaller widths, but the flags were still made-up in yard lengths. Consequently the proportions changed from 11:18 in 1687 to 1:2 in 1837. In the 1770's bewper was 19 inches wide, so the flags then had the proportions 19:36 or 9.5:18; very close to 10:19. Note. The flags were actually made-up in half-breadths and half-yards, but the explanation is simpler if given in whole units and doesn't affect the proportions. 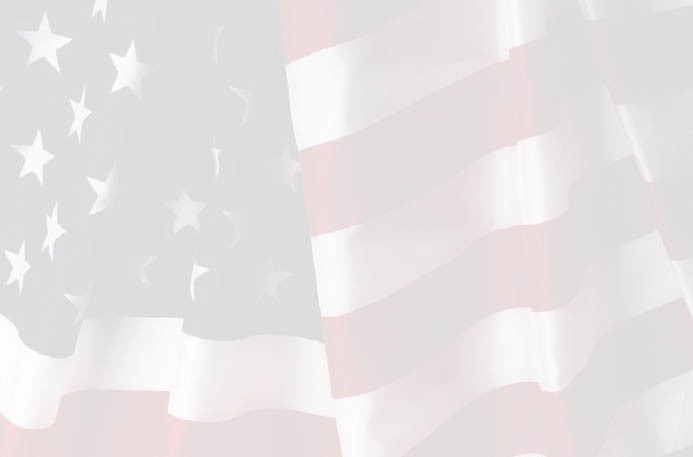 The source for U.S. flag proportions is actually Executive Order 10834.